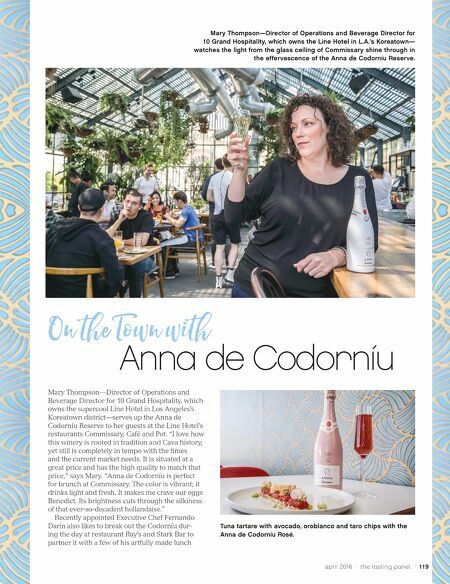 1 18 / the tasting panel / april 2016 EVEN AFTER 450 YEARS, ANNA DE CODORNÍU STAYS HIP W here to begin . . . Seriously, where do you begin when the producer you're writing about has been around since the 16th century? Especially when this winemaker is responsible for defining the very category of wine it sells. I guess with just the name, right? Codorníu (pronounced co-door-NEW). If you haven't heard of Codorníu, chances are you haven't heard of Cava—Spain's version of traditional méthode champenoise sparkling wine, in which secondary fermentation is achieved in the bottle. Although Codorníu was founded in 1551, it wasn't until 1872 that Josep Raventós—descendant of heiress Anna Codorníu and enologist Miguel Raventos—introduced a sparkling made in the método tradicional. He likely got the idea while traveling through Europe selling his still wines, including, of course, a visit to Champagne. Initially they even called it Champaña, but eventually ended up going with Cava, which means "cellar" or "cave" in Catalan. A well-deserved, unique name, as there are a few major distinctions between the two, other than not being from Champagne. Born in the town of Sant Sadurní d'Anoia in the Alt- Penedès (one of Europe's highest-altitude winegrowing regions) in Catalonia, Cava is traditionally made from three white grapes, principally Parellada, but also Macabeu and Xarel·lo. Cava DO requires less time on lees than Champagne: nine months for the usual stuff, 15 months for reserva and 30 months for gran reserva. Then, just over 30 years ago, in 1981, Codorníu lobbied to include Chardonnay, and today it is allowed in the mix as a result. In fact, these four white grapes make up the majority of the Penedès vineyards, although Cava DO by law can also contain Garnacha, Pinot Noir, Tinta, Monastrell, Trepat and Malvasia. The addition of the fresh, sophisticated Chardonnay spawned Anna de Codorníu—and it's these Burgundian-esque versions of Cava, some of them including Pinot Noir, that fare well with extended aging on lees. (The traditional blends of Spanish grapes tend to be earthier.) Although at least 95% of Cava is produced within Penedès, it's impor- tant to note Cava technically covers a style, rather than a region. What is also important is that while Cava may have been inspired by France's Champagne, Cava eventually ended up influencing France! Namely via employment of the gyropalette—a piece of equipment that automates and expedites the riddling process in the production of sparkling wine—as well as through refined dosage levels. Today, Codorníu is the world's oldest bottle-fermented sparkling producer and the oldest family- owned business in Spain. Its crown jewel, Anna de Codorníu, is sourced from two different regions within the Cava DO and made up of a blend of 70% Chardonnay, 15% Parellada, 7.5% Xarel·lo and 7.5% Macabeo. The Chardonnay comes from the continental climate of Lleida, while the native grapes come from the warmer Mediterranean climate of the Penedès. The wine spends 15 months on lees and the result is a citrusy, clean, elegant sparkler. 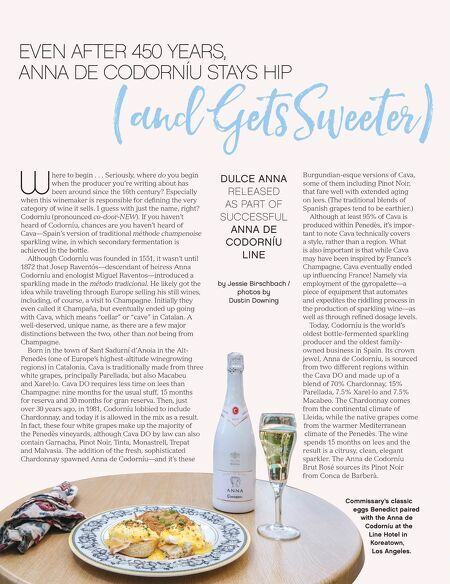 The Anna de Codorníu Brut Rosé sources its Pinot Noir from Conca de Barberà. DULCE ANNA RELEASED AS PART OF SUCCESSFUL ANNA DE CODORNÍU LINE by Jessie Birschbach / photos by Dustin Downing (and Gets Sweeter) Commissary's classic eggs Benedict paired with the Anna de Codorníu at the Line Hotel in Koreatown, Los Angeles.